You may have noticed that there's a trend to wear more and more fashionable clothing when climbing. Just go into a mountain store and you'll find a piece of climbing clothing for everything: bouldering, alpine climbing, whatever. While I'm not particularly a fashionable guy, I do enjoy a good pair of pants to wear during my redpoint attempts. 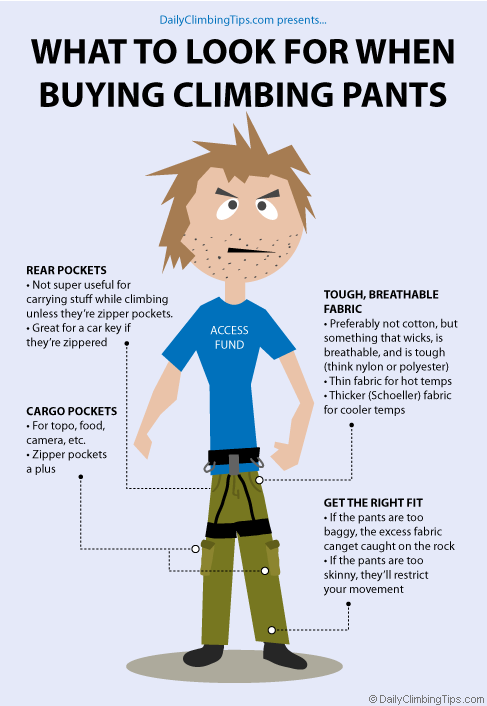 So I figured to share with you this cool infographic and video made by Tristan Higbee on his Daily Climbing Tips blog. Get the right fit - that's something each of us should decide for ourselves what it means. The point is you don't wanna trade your ability to move for looking good. If you're also a blogger and wanna learn how to blog like a rock star, you should also check out Tristan's main blog - BloggingBookshelf.com where he teaches blogging tips for smart people. He's got incredible quality content - that's my vote for him! Cheers! And if you get pumped during your ascent, shake, chalk and hope a jug will follow!